…..the shop front in King’s Lynn….. 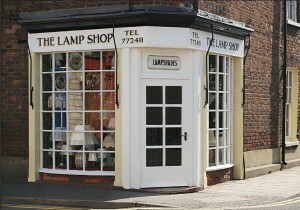 The Lampshop is one of the longest established independent decorative lighting shops in the UK. David Herbert inherited the shop from his parents in the late 1970s and has since expanded to offer a range of services while maintaining the personal touch. The “Aladdin’s cave” like shop in King’s Lynn is filled with a huge selection of traditional and modern lighting, some of which can be seen here. The Lampshop has their own exclusive range of classic cast brass lighting in antique and polished finishes that are often fitted with exclusive English hand-cut lead crystal shades. Bespoke lampshades are a speciality. These allow customers their choice of fabric to create unique shades in most shapes and sizes. David also offers renovations and re-wiring of lighting – including table lamps, chandeliers and wall lights. Please contact The Lampshop to discuss your own specific requirements and we will be able to advise on whether you’ve found your perfect light fitting or if we can supply you with a better alternative.